I compare all libraries now throughout the civilised world to great and numerous dens of vile rattle-snakes; but the snakes are not so bad as the false books – the rattle-snakes only destroy the body, but cannot injure the immortal soul, whilst the books sent forth by false philosophers cause the people to err, and those that are led by them are destroyed: then what is to become of the authors of these false works? Novels are nothing but lies, and also cause the people to err, for many are so silly-minded as to take more notice of such like nonsense than they do of God’s holy word; so they cause the people to err also. And all those men that pretend to be lecturers are infamous, for their lectures only consist of what they copy from books published by false men; for none of them are any philosophers. Such like men do a serious injury to mankind, from the king to the beggar. During his residence in Wallsend, and later in Newcastle, William Martin publicised a multitude of tracts and pamphlets expounding his religious and philosophical views, and claiming inventions patented by others. He also delivered lectures and travelled up and down the North of England selling his publications. 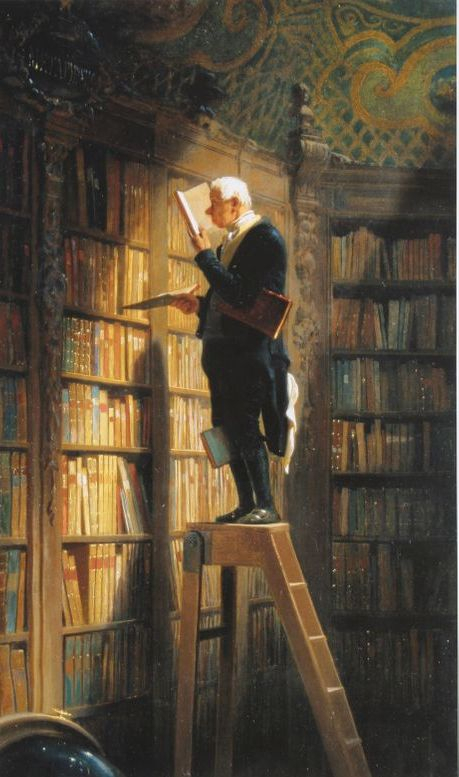 Der Bücherwurm [oil painting], Carl Spitzweg, 1850. Museum Georg Schäfer.